Hasn’t anyone ever heard of the Medieval Warm Period? Video of the PREVIOUS DECADE- RELEVANT EVEN MORE TODAY! Scientists, people and officials who do not believe in Anthropogenic Global Warming are not fit for office! Far more interesting that way. Rajendra Kumar Pachauri the chair of the Intergovernmental Panel on Climate Change (IPCC), (who is a strict vegetarian, partly due to his beliefs as a Hindu, and partly because of the impact of meat-production on the environment), is accompanied President Obama and Al Gore. Does Rajendra believe in climate change? Well he does have a MS degree in Industrial Engineering from North Carolina State University and a joint Ph.D. in Industrial Engineering and Economics. He has had a number of directorships including one at the Indian Oil Corporation and has been awarded the prestigious Padma Bhushan by the Indian government and ‘Officer of the Legion of Honour’ by the French government. With his PhD in Economics he will no doubt be aware of the effect on the world, should governments adopt the recommendations of the IPCC. Well one of the catches in telling huge porkies and spreading copious BS around the world is that you start to believe your own BS. So Rajendra one way or the other, has invested so much in the dangers of global warming that he has to believe his own BS. He may personally gain so much financially, it is fitting that he wears the clothes of his own making. However maybe it should be Ki Moon with the crown. President Obama believes in climate change because he will do anything to woo the voter, besides he would not be fit for office if he did not respect the UN. I hope for his sake that he has a Plan B. What would one expect from someone who buys carbon credits to offset the huge “carbon footprint” of his home from a company he owns? Of course he will continue to admire the emperor’s new clothes and even regularly suggest that the emperor deck himself out in even greater and more expensive(for the tax payers of the world) gowns and uniforms. Helen Clark prime minister of New Zealand (emeritus) and John Key current prime minister of New Zealand hold the invisible train for the emperor. Of course they dont believe in Anthropogenic CO2 induced Climate Change either. Helen Clark is looking daggers, because at number three on the UN she feels that at least she should have the Empresses job but she knows better than to wear invisible clothes(Thank God). John Key looks a bit weary but he will do his bit to cooperate with the IPCC because back home it buys him votes from a gullible New Zealand public. Behind them marches Gordon Brown who is ready to permanently mortgage the UK economy in the name of Anthropogenic CO2 Induced Climate Change. He marches even though the UK public are gradually catching on to the depth of the lies and how much they are likely to be shafted. Also behind marches Kevin Rudd, Prime Minister of Australia who believes so passionately in climate change he tried to ram an ETS bill through the Australian Senate. Unfortunately when he tried to make a deal with the leader of the opposition, which if successful, would have ensured the ETS scheme passing into law, the opposition quickly fired their leader and elected another, on the condition that he was not a believer in Anthropogenic Climate Change, which ruined the deal. Hence the sad look on Kevin Rudd’s countenance. Hans Andersen’s “The Emperor’s New Clothes” the meaning of which was always lost on me as a child, illustrates the current climate change hysteria perfectly. Man are we ever being bombarded by porkies every day. I am going to list some more remarkable or laughable porkies in other pages or the comments section of this blog, if you have some as well please feel welcome to contribute. 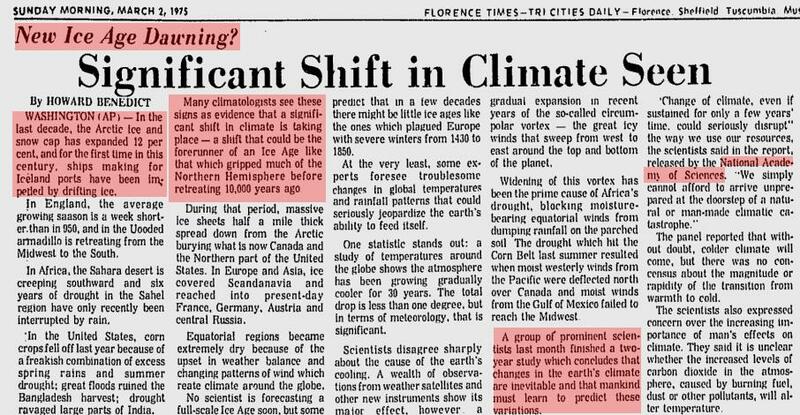 What is this Climate Change nonsense all about anyway? and you don’t need to be a scientist or highly qualified person to figure that out. Neither should you be dismayed to realise that humans cannot yet control the climate any more than good ole King Canute could control the tide. I’m with the church on this one, only GOD whoever or whatever he/she may be can control the climate! So Far! So lets get out and save the planet from the real dangers it faces, like heavy metal contamination, pollution of water, noxious gases (of which CO2 is not a member), garbage filling our oceans and landfills and the like and at least enjoy the warmer weather while it lasts. By the way, the notion that warmer weather causes deserts, icecap degradation and worldwide starvation etc is another porky. We should be more afraid of global cooling which history shows is the real danger to mankind and other living things. Just to share with you my reasonings behind all this. I mean why else would I be so disrespectful towards Rajendra Pachauri and President Obama? Anyway lets put our wonderful brains (bequeathed to most of us by the above mentioned God) to work and find about about things. Didn’t we all at primary school study the vikings, Eric the Red and the colonisation of Greenland and voyages to Vinland? It was warmer back in those days, so warm in fact that the vikings settled in Greenland and had dairy farms and a working community and culture for about 400 years. Unfortunately the weather closed in on them. Global cooling occurred, (known as the “Little Ice Age” and one way or another, by about the 15th century the community at Greenland was abandoned. and what is fascinating to me is that the archaeologists had to remove layers of PERMAFROST to examine the remains. This is mentioned in several accounts and probably more if you can read Danish. The archaeologists also stated that this was a wonderful find because the site had been frozen for the last 500 years. Although things may be getting warmer, we haven’t got warm enough to melt the permafrost at Gården under Sandet yet. 2. At a place called Schnidejoch in Switzerland (sometime spelt Schneidejoch) all of a sudden medieval, roman and stone age artifacts are being discovered emerging from the ice and snow. It appears that this area has been used a short cut between North Italy and the Bernese upper country for a number of periods in the past. In fact the artifacts appear to relate to only four different epochs, The late Stone Age, the Minoen Warm Period, the Roman Warming and the Medieval Warm Period. Even the remains of a roman guest house has been found a few hundred meters below the pass. It appears that because of the current retreat of glaciers the pass is opening again! So we can be very sure that not only Greenland was once warmer than the present but so were many other parts of the world! WOW! Maybe it was warmer globally? Want some raw data? Check out the Greenland Ice Core research results. Looks like we have another .5C warming yet at least to equal 1,000 years ago. In fact the era around about 1,000 AD is well documented and is known as The Medieval Warm Period. So here is the rub! The world has been warm before. And at that time it could not have been due to humans putting co2 into the air. So why do we think nowadays that CO2 causes global warming? Well thats one of the porkies I have been mentioning so please look in the comments. Anyway further research of the historic kind (which I touched on above) show a number of warm periods, most warmer than now. There are many important issues to consider from the graph above these paragraphs. The sky-blue line, which corresponds to the boreholes obtained from Greenland, shows that the amplitude of change of temperature at those latitudes was wider than the other proxies; for example, it is wider than the change of temperature at the Sargasso Sea surface, where the amplitude of change of temperature could be the narrowest change compared with the other proxies. The green line corresponds to the concentration of carbon dioxide in the atmosphere obtained from the study of bubbles of air trapped in the ice at the Vostok ice core. The line is almost smooth from 11000 to 5000 years ago, and it starts to ascend when the amplitude of the change of temperature decreases (red line), that is, becomes narrower. That time corresponds precisely to 5000 years ago, not 250 years ago, related to the industrial revolution. 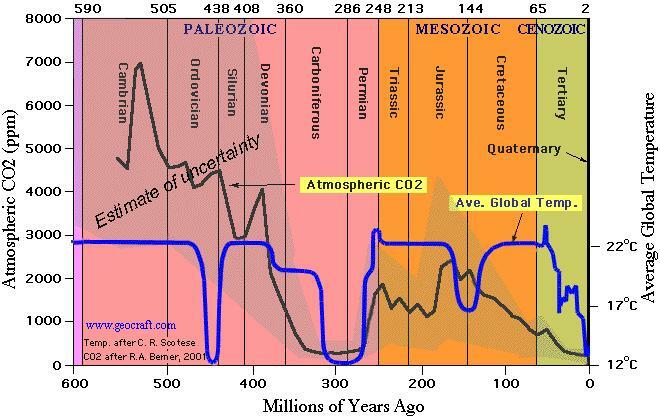 Actually, the increase of the concentration of carbon dioxide in the atmosphere began 5000 years before present. The red line is the average of the change of temperature deduced from all the proxies represented here. 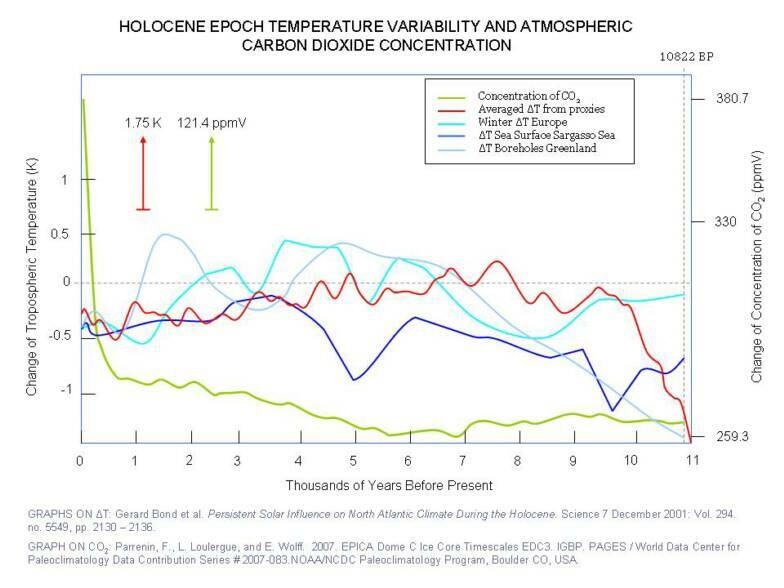 It is evident that the sharp increase of the concentration of atmospheric CO2 is closely related to the very narrow amplitude of the change of temperature given in the last 250 years. Consequently, it suggests that the increase of the concentration of the atmospheric CO2 cannot be attributed to human activities, but to natural phenomena. The global change of temperature during the Holocene Epoch has been from 2.25 K to 7 K. In the last two centuries the change has been only 0.52 K. Thus, the global warming throughout the last decades has not been unique or higher than in the past. Broecker, Wallace S. Was the Medieval Warm Period Global? Science. 23 February 2001. Vol. 291. No. 5508, pp. 1497 – 1499. Bond, Gerard et al. Persistent Solar Influence on North Atlantic Climate During the Holocene. Science 7 December 2001: Vol. 294. no. 5549, pp. 2130 – 2136. Annals of the New York Academy of Sciences. Lewis, M. W. The Flight from Science and Reason-Radical Environmental Philosophy and the Assault on Reason. Editors: Paul R. Gross, Norman Levitt and Martin W. Lewis. 1996. New York, NY. David Jablonski, Douglas H. Erwin and Jere H. Lipps. Evolutionary Paleobiology. 1996. The University of Chicago Press. Chicago, Ill.
Loehle, C. 2007. A 2000-year Global Temperature Reconstruction Based on Non-treering Proxies. Energy & Environment 18(7-8): 1049-1058. Parrenin, F., L. Loulergue, and E. Wolff. 2007. EPICA Dome C Ice Core Timescales EDC3. IGBP. PAGES / World Data Center for Paleoclimatology Data Contribution Series # 2007-083.NOAA/NCDC Paleoclimatology Program, Boulder CO, USA. Petit, J.R., Jouzel, J., Raynaud, D., Barkov, N.I., Barnola, J.-M., Basile, I., Bender, M., Chappellaz, J., Davis, M., Delaygue, G., Delmotte, M., Kotlyakov, V.M., Legrand, M., Lipenkov, V.Y., Lorius, C., Pepin, L., Ritz, C., Saltzman, E., and Stievenard, M. 1999. Climate and atmospheric history of the past 420,000 years from the Vostok ice core, Antarctica. Nature 399: 429-436. Sykes, Bryan. 2001. The Seven Daughters of Eve. W. W. Norton & Company Ltd. London, UK. V.L. Koshkarova and A.D. Koshkarov (2004). “Regional signatures of changing landscape and climate of northern central Siberia in the Holocene”. Russian Geology and Geophysics 45 (6): 672-685. Yang, B., A. Braeuning, K. R. Johnson, and S. Yafeng (2002). General characteristics of temperature variation in China during the last two millennia. Geophys. Res. Lett., 29(9), 1324. You may be aware that IPCC reports typically use a mixture of direct data and proxies (measurements from tree rings and ice cores etc) in their essential graphical reports. They certainly do this with their CO2 level reporting as well. Just scrutinise their graphs carefully! But proxy deductions are not as accurate as direct measurements so why not use them? 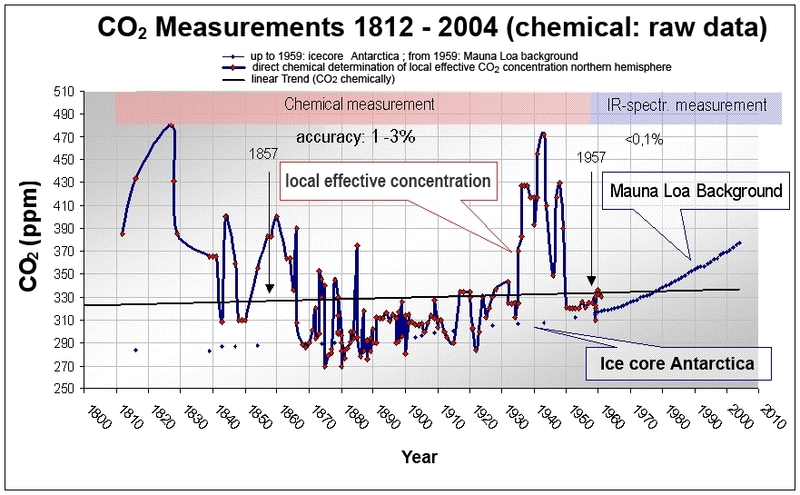 DIRECT MEASUREMENTS OF CO2 ARE AVAILABLE FROM 1812! What do direct measurements of CO2 tell us? Check for yourself on the graph and report below! At the very least IPCC publications should at least acknowledge this data and provide very good reasoning on why has been ignored. Ice Core data doesn’t appear to be too hot either when the method of analysis is examined and any calculation of error or uncertainty of ice core data is conspicuously absent. Thats all for now folks, just keep right on voting for our “Anthropogenic Climate Change” leaning government. (I hate to say that they actually believe in it), but so long as us, the voters want them to, they will happily tax us and if Gordon Brown and others are examples, simply ruin our economies and standard of living and create severe hardships for us all trying to chase after CO2 a friendly gas upon which all life depends which at higher concentrations improves tree growth and agriculture and food production and most certainly any Emissions Trading Scheme will have zero effect on the health of our planet. PS. I have recently been alerted to this documentary which shows things far better than I can write them. It includes interviews of some IPCC associated scientists, a number of other scientist eminent in this field AND the co-founder of Green Peace. Allow for over an hour to view. I am going to lobby my local TV channel to show it. It certainly is of sufficient quality so why dont we all do the same? PPS: I have just been alerted to these following web sites. I cant believe they have got so little publicity but if you want a good solid and well referenced review of the Climate change science, which has the support and recommendation of what looks like most of the scientists in the US then take a read. They are not a source for my blog but certainly they share many if not all conclusions. Will be interested to hear your comments about these sites. A wee video about reporting of Climate Change over the last 100 Years. I like this report on Anthony Watt's blog. Monckton at his best. Is Wikipedia going to be more even handed in it's treatment of AGW? My Other Blog where I record conversations that Global Warming Protagonists put in the "too hard basket"
The Royal Society has trrouble with it's arithmetic? This blogger has come to the same conclusions as me. INDEPENDENTLY! A must watch documentary on Global Warming includes Green Peace co founder and IPCC scientists. Allow yourself about 80 minutes to view. Best commentary on the AGW hypothesis I have ever seen. Why is New Zealand poorer than Australia? This is an example of the result of a shonky hypothesis. whereas glacier on Mt Kilimanjaro is disappearing because of lack of precipitation caused by climate change. IPCC Report Card – How well does the IPCC have its references covered? NASA Are they idiots or just desperate to tell us lies? The pics are 2 years older than the text! Legal Cross examination of IPCC and other AGW Evidence. An impartial and deep analysis of the Information we are all being bombarded with today. Did you watch the video of NIWA having questions asked in Parliament? Here is its sequel! The New Zealand agency for producing climate data seems to have the Climate Warming Disease as well if this video of the NZ Parliament question time is anything to go by. Emergency! 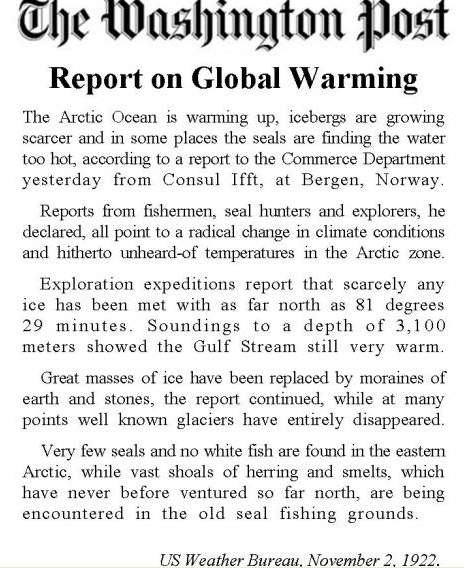 Incontrovertible observations showing the Arctic ice at an all time low and the sea at alltime warmth! What about this climategate thing then. Check out what Telegraph has to say about it. Ethanol as a great substitute for CO2 producing ecologically and unsustainable oil? More from US Senator Imholf's Website. Lists eminent scientists who are glad to be called skeptics. Why dont these get published in the mainstream press? 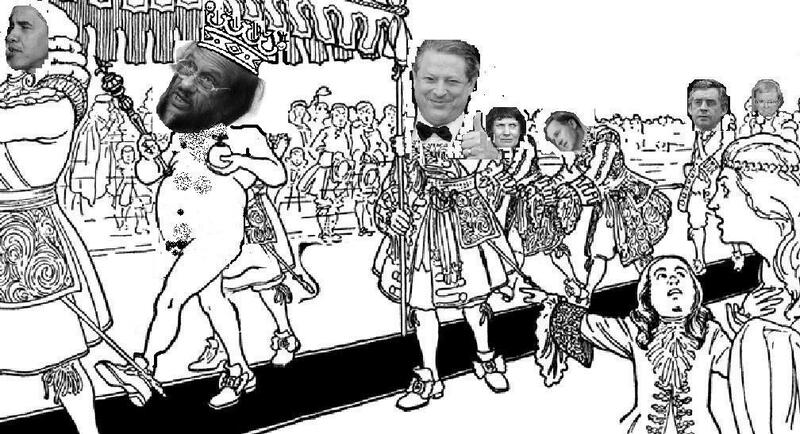 Porky No 3 IPCC Tries to change History! Now 1,000 International Scientists Dissent Over Man-Made Global Warming Claims. Thats more than the number who wrote the IPCC Reports! The Petition Project. This is a major petition over Anthropogenic Global Warming. These people have huge scientific support. It dwarfs the academic support that the IPCC commands. Its a must visit. I cant believe these guys havent got more publicity! Check this link out. It is from the Australian Green Party website. I cant believe that they protest over globalism. When I first set this link up the site was full of communist dogma. Looks like they have retreated into the woodwork again. Great commentary on the New Zealand political scene. Have the legislators of Montana got the guts to see this bill through? Professor David Shearman, Assessor for the Intergovernmental Panel on Climate Change Third Assessment Report and the Fourth Assessment Report. Check out his views. The Green Agenda. Well researched site with good references. Ever heard of the Club of Rome? Will the IPCC Survive? An article from The Telegraph. An Analysis of probabal errors in temperature recording. Detailed and technical and convincing. An Independant Report on the Effects of Climate Change on Flora & Fauna. Will species die out because of the heat and extra CO2? Dr Roy Spencer, the most sensible commentary on "climate change" I have found. Dr. Nils-Axel Mörna the former President of International Union for Quaternary Research (INQUA). INQUA recently declared a possible sea level change of +5 cm ±15cm by the year 2100. No the 15cm is not a typo! Interview of Ian Plimer author of Heaven and Earth. Well worth a look and listen. IPCC Report Card. A grade of F would you believe. Delete the un peer reviewed docs and the whole report is useless. NOAA is coming apart! Falsified Data and failing and inaccurate equipment? Settled Science and the Debate is Over? Water Vapour or CO2? Which has the greater effect? Who said that Global Warming is bad for Agriculture? The UN is the Culprit!